Noah Tester of Wauseon, left, looks to bring down Mitchell Kruse of Napoleon in a non-league game this season. He was selected first team All-NWOAL defense. J.D. Osborn of Delta with a run against Rogers this season. He was second team All-NWOAL offense for the Panthers. 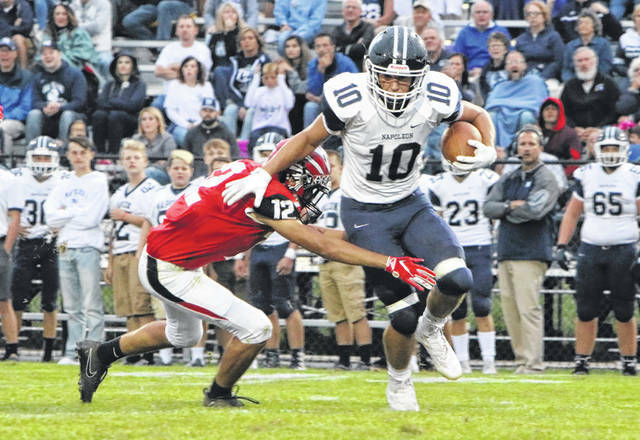 Several area players received high honors on the Northwest Ohio Athletic League all-league football teams announced last week. First team All-NWOAL offense in Fulton County was Chandler Lumbrezer of Evergreen. Bryan quarterback Nate Miller was offensive player of the year. Patrick Henry mentor Bill Inselmann was named coach of the year in the league. 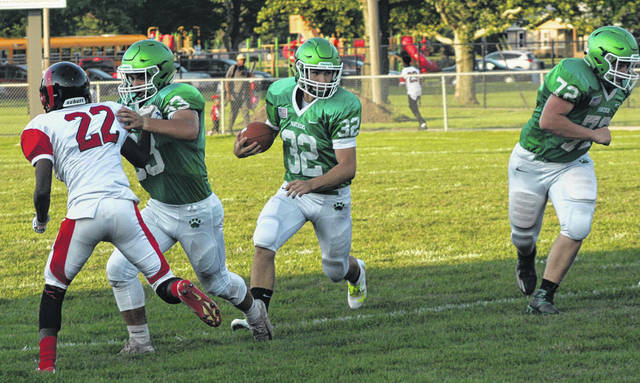 Wauseon had a pair of players make the first team on the defensive side. Defensive back Noah Tester and defensive end Trevor Rodriguez were both first team all-league. For Archbold, interior lineman Kasyn Schaffner made the first team. Lineman Nate Kohlhofer was on the first team for Delta. Hunter Tresnan-Reighard of Delta and Joey Shema of Wauseon were first team all-league as specialists. Quarterback- Nate Miller, jr., Bryan. Backs- Wil Morrow, jr., Patrick Henry; Caleb Carpenter, sr., Liberty Center; Zach Bowers, jr., Liberty Center. Receivers- Brycen Andrews, sr., Bryan; Kolton Holloway, jr., Patrick Henry; Chandler Lumbrezer, sr., Evergreen. Tackles- Garrett Schweibert, jr., Patrick Henry; CJ Johnson, sr., Liberty Center. Guards- Spencer Gerschutz, jr., Patrick Henry; Jacob Romine, sr., Liberty Center. Center- CJ Spradlin, sr., Liberty Center. Player of the Year: Nate Miller, Bryan. Coach of the Year: Bill Inselmann, Patrick Henry. Quarterback- TJ Rhamy, jr., Patrick Henry. Backs- Hunter Vanwert, sr., Evergreen; Noah Gomez, soph., Archbold; J.D. Osborn, sr., Delta. Receivers- Titus Rohrer, soph., Bryan; Antonio Cruz, soph., Archbold; Brendan Morris, sr., Liberty Center. Tackles- Trevor Rodriguez, sr., Wauseon; Mason Babcock, jr., Archbold; Nate Kohlhofer, sr., Delta. Guards- Keegan Brown, sr., Bryan; Xavier Williams, sr., Swanton. Center- Matthew Gladieux, jr., Archbold. Defensive backs- Connor Arthur, jr., Bryan; Austin Like, sr., Liberty Center; Noah Tester, jr., Wauseon. Ends- Matt Herold, sr., Bryan; Trevor Rodriguez, sr., Wauseon. Linebackers- Alex Potvin, sr., Bryan; Maguire Vollmer, jr., Liberty Center; AJ Healy, sr., Patrick Henry. Linemen- TJ Rhamy, jr., Patrick Henry; Kasyn Schaffner, sr., Archbold; Nate Kohlhofer, sr., Delta. Player of the Year: TJ Rhamy, Patrick Henry. Defensive backs- Bryce Hudik, sr., Evergreen; Elijah Zimmerman, jr., Archbold; Tony Grime, jr., Archbold. Ends- Brayden Peterson, sr., Patrick Henry; Aiden Warncke, sr., Archbold. Linebackers- Nick Beemer, jr., Evergreen; Isaac Wilson, soph., Wauseon; Derek Floyd, sr., Swanton. Linemen- Cam Gebers, sr., Patrick Henry; Miguel Gomez, sr., Wauseon; David Maassel, sr., Liberty Center. Parker Strauss, sr., Liberty Center; Orry Killam, sr., Liberty Center; Hunter Tresnan-Reighard, jr., Delta; Joey Shema, sr., Wauseon. Riley Hensley, jr., Swanton; Zach Lumbrezer, sr., Evergreen. Archbold: Brandon Taylor, Zach Rocha, Isaiah Gomez, Clay Nafziger, Caleb Hogrefe, Carson Meyer, Izzy Reyes, Holden Galvan. Delta: Tristen Saeger, Max Hoffman, Noah Druschel, Dalton Richard, Jose Arroyo, Dawson Swicegood, Shawn Cook, Logan Echler. Evergreen: Jack Etue, Trent Coopshaw, Will Smithmyer, Jack Worline, Colten Pawlaczyk, Dave Carroll, Isaac Yunker, Jack Krispin, Brian Floyd, Bryce Eisel. Swanton: Michael Lawniczak, Tyler Gowing, Josh Vance, Derek Floyd, Conner Cass, Hunter Mix, Dylan Gilsdorf, Ian Saunders, Kodi Jones, Xavier Williams, Xavier Wiemken, Ryan Marvin. Wauseon: Xavier Torres, Sean Brock, Zeb Smith, Garrett Demaline, Sam Frank, Connar Penrod, Joey Shema, Jaiden Falke, Zac Carroll.